Christians in Iraq are facing their "biggest and greatest challenge" as they return to their homelands freed from the Islamic State, according to human rights activists. The very future of Christianity in its cradle is on the line. Ashur Sargon Eskrya, president of the Assyrian Aid Society branch in Iraq (AAS-I), told Breitbart News that Christians face great dangers as they seek to return to Mosul, which was recently liberated from the IS terrorists. "Iraqi Christians (Assyrian,Chaldean) are indigenous peoples of the country, according to historical sources, and their future in Iraq depends of on international support and protection. Without protections, they will not be able to live in Iraq any more," Eskrya said in an email. 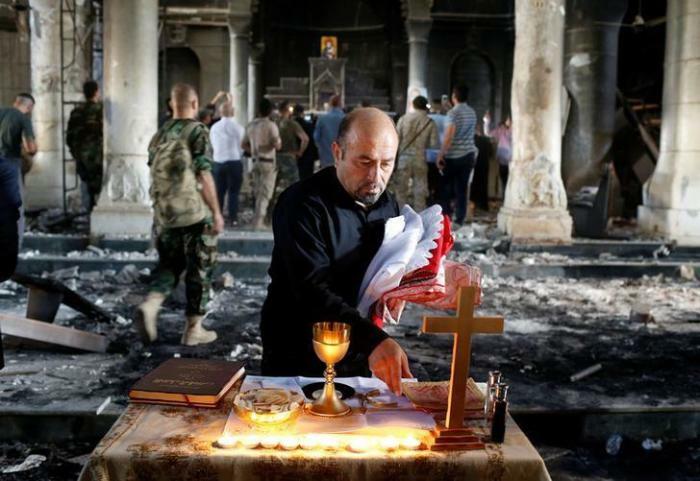 "It is critical time for the Christians of Iraq — 'to be or not to be.' The Christians of Iraq are facing their biggest and greatest challenge" in post-IS Iraq, he said. Former Rep. Frank Wolf (R-Va.), who is a distinguished senior fellow in the 21st Century Wilberforce Initiative, aimed at saving religious minorities in Iraq, pointed out that "more biblical activity took place in Iraq than any other country in the world, other than Israel." "I think there's an opportunity to save Christianity in the cradle of Christendom. Now is the time. We have an administration that's open to doing something," he said, referring to the administration of U.S. President Donald Trump. "There's a willingness and desire on the part of the Christians to stay. I think given protection and coordination with housing and infrastructure, they will return," he added after a recent visit to Iraq. Martha Hudson, an advocate for minority groups in Iraq who traveled with the congressman, positioned that it is "now or never" for the Christian population there. "We are at the tipping point and if we do nothing, we will lose Christianity in the cradle of Christianity. As Christians, this is our homeland and we must do everything to save it," Hudson declared. She pointed out that close to 1,000 families have returned to the city of Qaraqosh, which was the country's largest Christian city before the onslaught of IS. Followers of Christ, who have been heavily persecuted at the hands of the Islamic extremists, have found their homes destroyed upon returning, and are in need of humanitarian assistance in order to restart life there. They are also reportedly facing imminent threat from IS cells still left in Iraq. While Wolf said that the U.S. made a step in the right direction last year by declaring IS' actions against Christians, Yazidis, and other minorities to constitute a genocide, Eskrya said that the situation for believers in Iraq has not changed. "We feel western countries are still not willing to save and protect Christians in Iraq," the AAS-I president said. Several groups have launched rebuilding efforts in Iraq. Knights of Columbus, the world's largest Catholic fraternal organization, announced an initiative earlier in August aimed at raising over $2 million to help the Archdiocese of Erbil restore the Christian town of Karamdes. "In talking with the folks in Iraq, the next 60 days are critical that if we don't start moving people home, they are going to start leaving the country for good," Andrew Walther, the Knights of Columbus vice president of communications and strategic planning, told The Christian Post at the time. "With the Christian population having fallen from 1.5 million to somewhere in the neighborhood, maybe a little south of 200,000, it's a now-or-never situation."